You are at:Home»Herbs»Curcuma longa Linn. Latin name : Curcuma longa Linn. Turmeric (Haldi) has a long history as a health promoting botanical worldwide. A natural organic antioxidant that fights free radical damage, increase general well being, defends the body from all toxins and helps to guard and rejuvenate the gall bladder and liver. This mutlifaced wonder herb helps to detoxify the liver, balance cholesterol level, fight allergies, stimulates digestion, boost immunity & enhance the complexion. Turmeric promotes weight loss by metabolizing fat. Turmeric is said to boost the effectiveness of chemotherapy especially the chemo drug paclitaxel and reduces its side effects. Recommended Dosage : 3 to 5 g powder of dried rhizome. Contraindication : Those taking blood thinners should avoid Turmeric, since it may add to their anticlotting effects. Extended use is not recommended, as it may result in stomach distress. 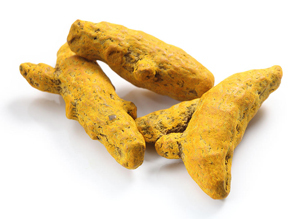 Turmeric is not recommended for persons with biliary tract obstruction, because it stimulates bile secretion. People with congestive heart failure, whose cause remains unidentified, should avoid this herb. Turmeric is not recommended for people with painful gallstones, obstructive jaundice, acute bilious colic or extremely toxic liver disorder. Because Turmeric is a uterine stimulant, pregnant women should avoid it.